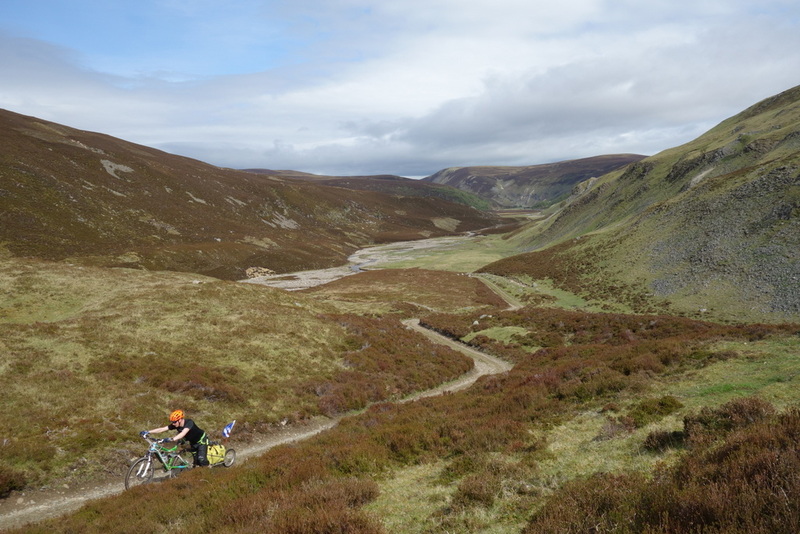 In late May I spent four days cycling around the Cairngorms with my friend Donald. This ride has been on my radar for many years but I have never actually allocated the time to it. What better opportunity than now, as a redundant man? Conditions were perfect, warm, sunny and with river levels so low I was able to maintain dry feet throughout. I also wrote this trip up for my new blog at WildTaiChi.co.uk. We opted to camp and carry our provisions. To carry this equipment we used two contrasting styles. Donald hauled his in a single-wheeled Beast of Burden trailer. This truly was a beast, with an unladen weight of 7 kg and a cavernous 100 L luggage bag. I used Alpkit bike packing gear, a bar bag and a seat post bag, and also a small day pack for the overspill. My lack of space pushed me towards the extreme lightweight end, relying on home made dehydrated food cooked using a Bushbuddy wood stove. Donald’s huge load capacity propelled him in the opposite direction. Read on to find out which approach prevailed…. We started late, around 1400, and cycled past Ryvoan bothy into territory that was new to me, through caledonian forest remnants towards the Eag Mor Gap, then down to Glen Brown and onwards to Tomintoul. The weather deteriorated and my plans for leisurely pints were replaced with a desire for a warm cup of tea, though I did wash it down with a miniature of Norsk Aquivit. This raised my spirits for the onward cycle up Glen A’an to Inchory, which I knew from my trip up Ben A’an and Beinn a’Bhuird last summer. There is a lot of tarmac and the cycling is good, but it was cold and I was glad to arrive at our campspot amid the nesting birds and face the challenge of cooking with twigs in the rain. Fortunately I had brought enough dry twigs from home and was able to arrange it just outside my tent in the light rain. The night cleared up and we were able to relax and enjoy a beautiful campspot. A fine day with no hint of the previous day’s rain. I did some Chi Kung while Donald enjoyed a lie in. The oystercatchers maintained a noisy patrol until I settled into my routine, after which point they paid me no more attention that they would a reed shaken by the wind. Thus refreshed and revitalised, I sourced enough dry heather twigs under a bridge to get my coffee and hot muesli cooked up. The section to Braemar was one that I had cycled in 2005 when we rode into Faindouran Lodge as part of training for our first alpine climbing trip. 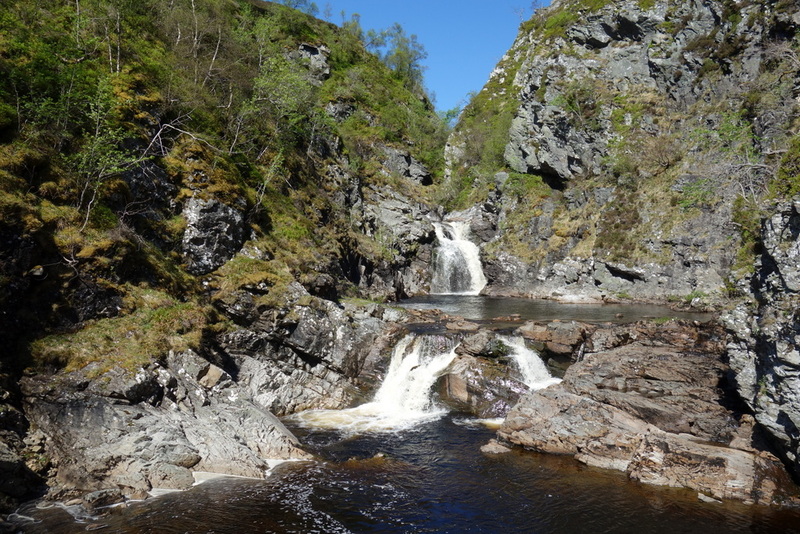 This section has beautiful riding up past the lochs and rivers of the upper glen, then a long haul up to 720 m before an exhilarating descent to Invercauld, followed by a road section to Braemar. We could have stayed on the other side of the river but we both fancied a bit of civilisation, with its fizzy drinks and ice creams. Donald had some shopping to do, having forgotten his mug and lost the saltire that decorated his trailer on a bumpy downhill. As it turned out no saltires were available for sale in Braemar. As we stood in the sun outside Braemar Mountain Sports I took another step towards my new lifestyle of minimalism, sealing a deal to sell my campervan to a chap who’d looked at it earlier in the week. I then drank two celebratory beers before we set off. As we rode I talked about my mixed feelings about having passed on the vehicle but I know that now is the time to let it go, when it has 12 months MOT and the market is full of eager early summer van buyers. Owning a van is a balancing act between joy and stress, and the balance began to tip for me last year. Now the kids can walk into wild camp spots it was getting less use than in past years, while requiring an increasing amount of maintenance to keep it in good shape. The haul up from Linn of Dee to White Bridge was virgin territory for me and hard going at the end of a long day. I had to resort to listening to Jimbo Jaytech’s latest selection of progressive house and trance to keep me moving. On the approach to the lodge there were a couple of walkers who were progressing at a disturbingly similar pace to us, though we did eventually pull ahead. 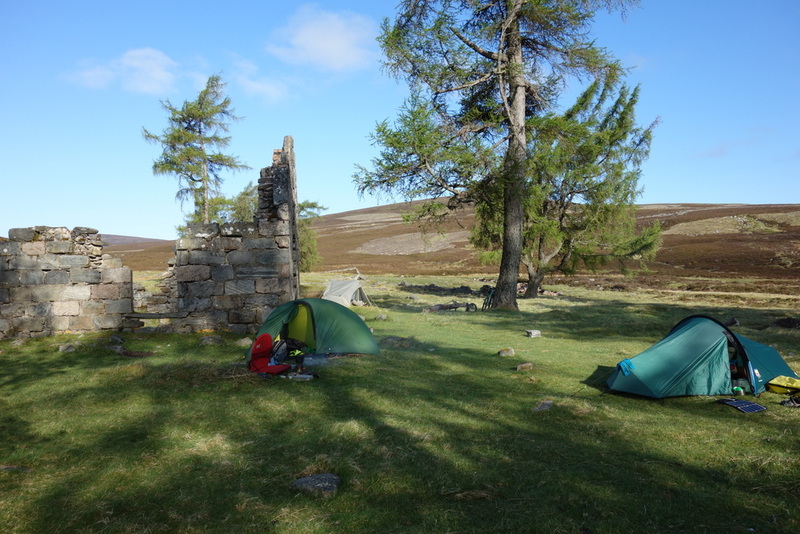 We had just pitched up when they arrived and they took a spot below the ruins of the old lodge. Two dutchmen arrived later on and pitched uncomfortably close to us. Had it not been for my earplugs I would have fallen asleep to the guttural inter-tent chatter of our friends from the low countries. We were last away from camp in the morning, and chased down both the walkers and the Dutchmen on the approach to Glen Tilt. This was familiar territory, bagged during a ride with Donald a few years back from Aviemore to Blair Atholl. On that occasion we caught the train back to Aviemore, but there would be no such luxury today. Donald spotted an adder slithering off the track in front of him and we paused to inspect it as it flicked its tongue in warning form the heather. This was only the third adder sighting in my life, and the second was in almost this exact spot on that earlier ride. After that sighting I had researched what to do in the event of an adder bite. Should one stay still and attempt to limit the spread of the venom, or rush for medical attention? To what extent would one be incapacitated by it? My research was inconclusive, with first hand accounts of bites hard to come by. My impression was that if I was ever bitten I would expect a fair amount of pain and unpleasantness but that my life and mobility would likely be maintained. There is a beautiful section of single track on a steeply sloping bank that leads down to the upper reaches of the Allt Garbh, a section that I had found challenging on a hardtail mountain bike, but which I was able to blast most of on a full suspension unit. I was surprised by the trailer’s ability to handle it, though Donald looked slightly frazzled by the effort required to propel his appendage over the rougher sections, and I stayed on hand at a couple of the worst to lend a helping hand. Landrover track resumed soon afterwards, and we soon left the walkers behind. There were other campers and cyclists out enjoying what is one of the most scenic glens, notable for its contribution to geology through Hutton’s interpretation of the intermingled granite and the metamorphic Moinian rocks, which showed that the rocks had once been molten, and had not sedimented during a biblical flood as advocated by the religiously inspired dogma of the time. With a long ride ahead we blasted on to Blair Atholl, keen to combine lunch and civilisation faff into one single instalment. In the village it was too hot to sit out in the sun and we enjoyed an unexpected injection of carbs and salt from the chip shop in the shade of a tree planted to commemorate the coronation of Edward VII. I had thought that it would be nice to sink a few cold beers but wasn’t prepared to risk weakening myself any further. There was still a long way to go. Despite its smooth tarmac the next section along the cycle path felt among the hardest of the trip, the intense heat made us seek refuge in islands of shade whenever we paused. 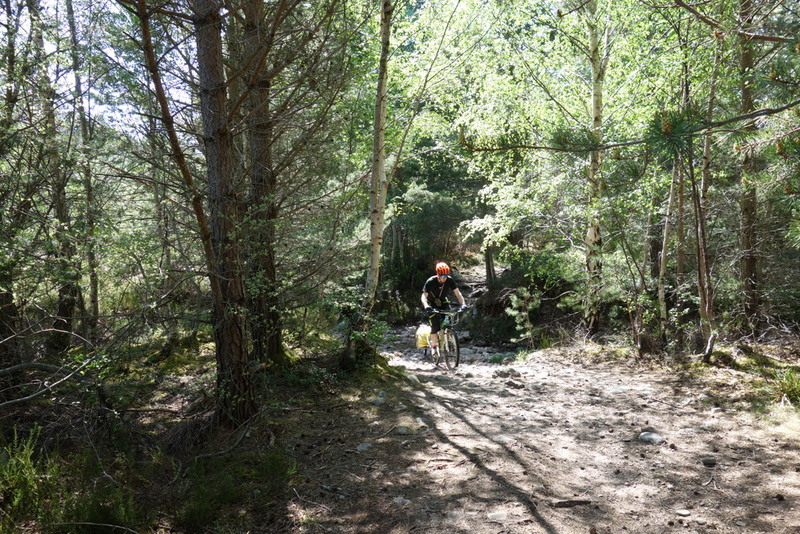 We passed Bruar, Calvine and Dalnamein en route to Dalnacardoch Lodge, where we crossed the busy dual carriageway and climbed through the merciful shade of a conifer plantation to access the high moors leading into Sronpadraig Lodge and the Gaick pass beyond. 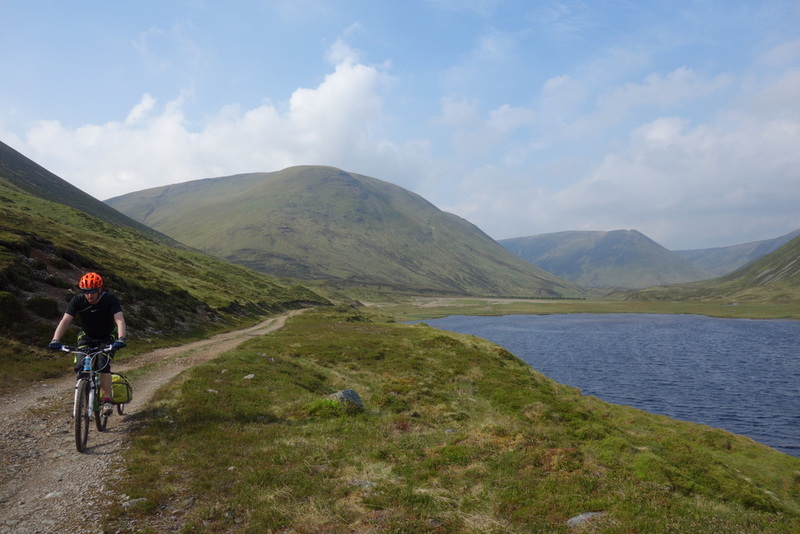 Once we were up above the A9 corridor we both experienced a second wind, uplifted by the expansive views to Schechallion and the Glen Lyon Munros. This was the section that I had been looking forward to most of the whole trip. 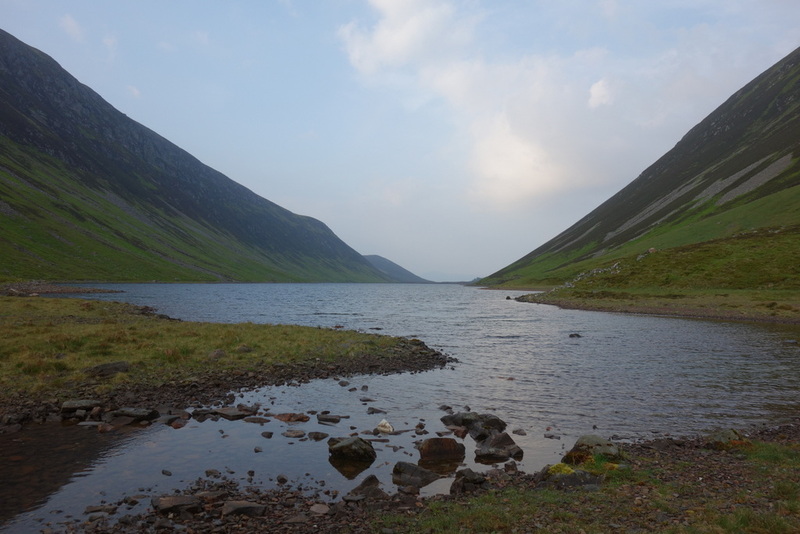 Back in 2011 I had ridden this route in reverse, enjoying an overnight camp at Loch an-t Seilich with friends who had cycled in from the south, before swapping car keys and going our separate ways, reuniting in Kingussie over a pint. I can still vividly recall the vivid colours of that day, the deep blue of the string of the three lochs, the vivid greens of fresh growth and the ochres of the gravels that define this area, together with a sense that I had uncovered a secret land, a vast tract of empty country that runs parallel to but remains completely hidden from the busy A9 corridor. Our plan was to push on past Sronpadraig Lodge as far as possible to maximise our chances of finishing at a reasonable time on Friday. We were delayed by an inspection of the creepy derelict lodge. What was formerly the bothy is now in use by the estate and is secured like Fort Knox. The large lodge lies open and though the roof is intact most of the interior is in an advanced state of deterioration, with only one decent room, a pink painted one with a fireplace and and old camp bed. In order to access this gem one has to make a committing approach along a hallway of dubious integrity. I recalled the next section of single track as being tough to the point of being unridable in sections from my previous visit, and also that the path marked on the map took a sub optimal route involving an unnecessary double river crossing. Donald had some business to attend to so I left him to it and cycled on to prospect the route. 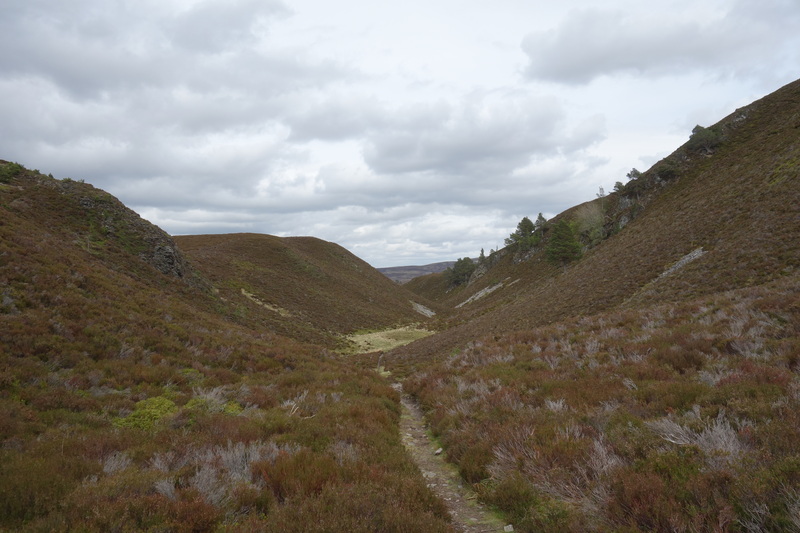 The river has cut into what I took to be a steep moraine, and the best route involved taking a steep track up its face then traversing pathless peat hag and bog to join the main stalkers path. 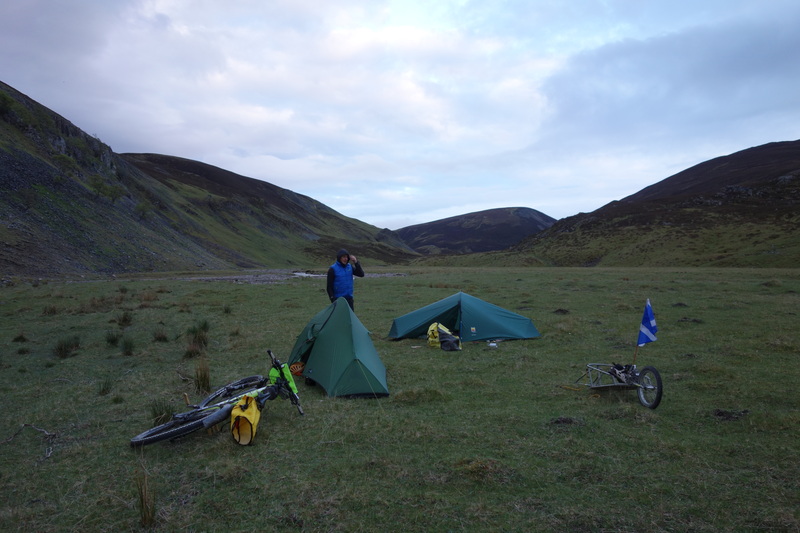 This was straightforward with my bike packing setup, and once I found the path I walked down to the lochside to check out camping spots, which were adequate but lumpy. I cracked into the first of my two remaining miniatures of whisky and waited in the last of the evening sun for Donald to appear. Donald reported that negotiating the steep face of the moraine had indeed taken his close to his limit and at one point he had actually taken to conversing with his trailer, cautioning it that it would not beat him, that they would stay together until the end of the journey. He seemed invigorated by the tussle and suggested that we push on further before camping. Taken from the south the single track alongside the loch was a real pleasure to ride, and we soon covered the 2 km to the its northern end, where we found a lumpy but beautifully situated camping spot and settled in for the night. This was my favourite camping spot, though I had to range far and wide to find enough twigs and heather stalks to fuel my wood stove. There was only negligible ascent on the route past Gaick and down Glen Tromie, making it an exhilarating blast. We took forest tracks over to Glen Feshie, followed the river to Feshiebridge then cut through the forests to Inshriach. The dry forest smelled like Yosemite, the air thick with the scent of pine. We paused at Inshriach bothy and were surprised to find a man in residence. His name was Iain, a Londoner who described himself as semi-retired, and planned to pass a few months bothying and camping round the Cairngorms until the grouse shooting season, which would earn him enough to export his minimalist lifestyle somewhere warmer over the winter months. I have a deep admiration for people like that, but doubt that I could manage to take it to those extremes. Maybe by the time I’m Iain’s age I’ll be ready! The pine smell intensified as we made our way past Loch an Eileen and Loch Morlich. I was in awe of Donald’s fortitude, despite all those tiring kilometres pulling his trailer he spurned the shortest route in favour of a satisfying and aesthetic tarmac free return to Glenmore, and the restorative ice cream and chip shops of Aviemore. For a trip like this the lightweight bikepacking approach beats the trailer hands down. That said, I didn’t spend nearly as much time waiting for Donald to catch up as I expected. Though the trailer handled extremely rough terrain comfortably thanks to its suspension, it is more in its element where the surface is good and the hills relatively small. It would make a great choice for transporting coal and beer into a bothy.